Since their break-through performance at Sónar in 2005, Booka Shade have earned huge recognition with their innovative live shows and classic albums. One of those classic albums, MOVEMENTS, is now set to celebrate its decade anniverasry with the duo of Arno Kammermeier and Walter Merziger releasing an expanded re-issue of the era-defining LP. Featuring 10 exclusive remixes from electronic music’s finest including Nils Frahm, Jonas Rathsman, Deetron (of which we exclusively premiered last month), Eats Everything, Dennis Ferrer, Patrick Topping, M.A.N.D.Y, Andhim, Hunter/Game and Chi Thanh , classic tracks including “Night Falls”, “Mandarine Girl”, “Lost High”, “In White Rooms”, “Wasting Time”, and “Body Language” are now brought definitively into the now. 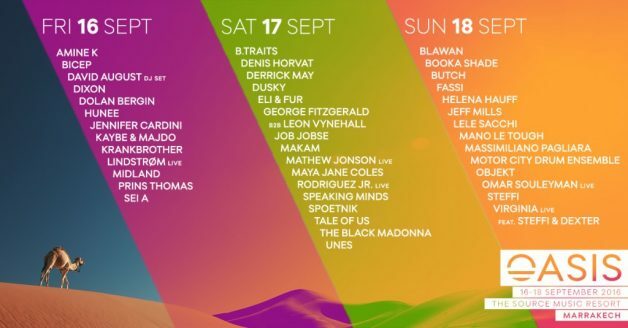 On 17 September, Booka Shade will make their debut appearance in Morocco at the 2nd annual Oasis Festival. At the event, the duo will share the bill with the likes of Derrick May, George Fitzgerald, Leon Vynehall, Maya Jane Coles, Tale Of Us, and many more. Anticipating the event we caught up with Booka Shade as they prep their MOVEMENTS 10 remix tour. In September you will be performing in Morocco at Oasis Festival. I’m wondering, how deep does your relationship with the country go? Had you performed there before? Visited? What are your impressions? It´ll be our first time in Morocco! We´ve never been, not even for private holidays. We´re looking forward to the premier. The festival, being mid-September, comes at the tail end of summer, which is always a rigorous time in this industry. How do you guys maintain mindfulness and health over the summer months? Do you have any specific protocol to “wind down” afterwards? I have to admit – we had crazy rock´n roll years…but nowadays we carefully look after our health, do sports, eat health food, because a live show the way we do it is physical exercise, and we always want to present the best possible live experience. One highlight certainly was the premiere of our MOVEMENTS 10 show at Sonar, Barcelona. It was nerve wrecking because the show features fully synchronised light and video, and 10 minutes before the show was supposed to start, a stage hand, who wasn´t supposed to touch any of our equipment, rolled a heavy subwoofer over THE most important USB cable and destroyed it. Thank god we have a fantastic tech crew and they solved the issue within minutes…apart from that, the show was great. A week or two ago, we premiered a Deetron remix off your upcoming “Movements” re issue. The LP features a rather robust selection of remixers like Scuba, Carl Craig, Dennis Ferrer, and more. Without going into each one, what was your thought process behind matching track with remixer? For example, why Deetron for ‘Mandarin Girl’ vs Hunter/Game for ‘In White Rooms’? We left a lot of decision to the remixers and which song they preferred. Dennis Ferrer wanted a not so well known song to give him more freedom to play around with the elements, so he chose the closing track “Lost High”. Hunter/Game wanted “In White Rooms” because ever since they started to produce music, they always loved the song. We recommended “Mandarine Girl” to Deetron because I was convinced he could come up with something cool for the song, and so it was. Personally, with “Movements” celebrating 10 years, take us back to the creation of the album. What were your initial hopes for the album at the time? It may sound strange, but at the moment in time we didn´t have much time to think and expect much, we were too busy producing music and setting up our label GET PHYSICAL. Our label had just started to get in full swing, we produced the releases for most of the other acts, such as M.A.N.D.Y. or DJ T. Our first album MEMENTO had achieved critical acclaim, we started to play bigger stages, our first appearance at Sonar 2005 had been for us what people call “a game changer”. It was a time full of positive energy and then a run of singles just took off: Mandarine Girl, Body Language (which was a slow grower! it took over a year to become big), In White Rooms, Night Falls…We put a lot of effort into the tracklisting of the album and the interludes / transitions. We wanted the album to be a journey from start to end. This alone took approx three months. With the anniversary, you also debuted a new “Movements” specific live show at Sonar. How does this live show different from your “normal” setup? Technically it´s a big show for us with loads of dedicated lights and completely new visuals which, for a large part, are based on artworks or the design world of the original artwork. We play some songs from the album we never played before, and all the classics such as “Body Language” or “In White Rooms” come in brand new arrangements. In reading through some of the PR behind “Movements” reissue, I’m curious by your embracing of the “an album is never done” mantra? Can you expand on this? How do you relate to this philosophy? How does the reissue play into this? What we mean is: songs keep evolving over time. When you finish an album and release it, it´s the (hopefully) best version you can come up with at the moment, and then, when you play the songs over the years, you keep re working them to keep them fresh for yourself and for the audience. With MOVEMENTS 10 we´ve come around in a circle, because the 2016 remix of Dennis Ferrer is already been reworked AGAIN by us for the live show. The same happens with Chi Than´s “Body Language” remix. I wanted to ask one technical question: If there was a “go to” piece of production gear for you, what would that be? Would that answer be the same if I asked 10 years ago? In 2006 ,when we produced the MOVEMENTS album, our most used instrument was the minimoog because we did everything from hi hats to bass with it. Nowadays we use a mix of everything that we have. We love the stuff from Native Instruments, from Audio Damage, Aturia or soundtoys (the microshift is great on everything) and we love the stuff from Universal Audio a lot (especially the Neve Plug ins). What have been some of your favorite music releases in 2016? Arno: Not a brand new one, but I just recently fell in love with the latest Tam Impala album. The new Last Shadow Puppets album is fantastic, if you´re into good old fashioned songwriting . What else are you looking forward to throughout the end of the year? We´ll present MOVEMENTS 10 at two exclusive headline shows in Europe, at Berlin (Heimathafen) and London (Royal Festival Hall). These will be quite special nights. After that, we take the MOVEMENTS 10 show to eight cities in North America in November / December, and right after christmas, We´ll fly to Australia for a festival round which includes a debut in Tasmania! You see, even after traveling the world for over 10 years, there are still new territories to explore.